Home/Heathy Eating/How Do I Eat Healthy? 9 Easy Tips! Every day you make lots of decisions of which foods to fuel your body with and when to do so. Sometimes you make good choices and sometimes not so good. So how do you develop healthy eating habits? I believe awareness is the key. First and foremost, awareness of your hunger or thirst. Think about this for a moment… Do you let a clock tell you that it’s time to eat? Even if you’re not really hungry? Or are you just too busy to even stop and eat meals during your day? And so you end up eating one huge dinner and snack all the way until bedtime? You’re not alone if these resonate with you! If my kids are home, I always make sure they get fed, and most of the time forget about feeding myself! The second layer of awareness is the actual type of “food” you are putting into your body and the time they take to digest. Processed foods high in carbs and sugars are quick and easy to take on the go with you, but not great options for fueling your activities during the day. That’s why lots of people get the 3 pm crash effect. Eating a lot of unhealthy processed food doesn’t provide the necessary nutrients and minerals that your body needs. Even if you take supplements and multivitamins, sometimes they aren’t all that helpful because they aren’t easily digested and just end up passing through the system. With the obesity problem exploding here in America, the biggest benefit of having healthy eating habits is maintaining a comfortable weight. Losing that “extra” 20 pounds can relieve a lot of strain and stress on your body and joints. Your body is able to heal itself more easily if you’re eating healthy foods with nutrients and minerals that are easily bioavailable. Drinks that have a lot of sugar in them – like soda, iced tea, juice, and designer coffees – add a lot of empty calories. This means that you are ingesting calories, but not getting any nutrients out of them. Soda and juice really isn’t good for you. One soda generally has double the amount of sugar than you should have in one whole day. Concentrated juice means that they take out water and you’re left with higher amounts of sugar. I quit drinking soda years ago. It’s a little too close to battery acid for my comfort! Keep a food diary and start to notice unhealthy trends. This could be the sugary snack or drink every day that you find a way to justify “just for today”. “Just for today” is okay for a snack occasionally, but you might find that “just for today” snack is actually eaten everyday. This adds up to an unhealthy habit that needs to be broken. Start reading nutritional labels of processed foods. It’s time consuming, but mind blowing when you first start reading labels. You’ll start to wonder what “natural flavors” actually means? It’s a good rule of thumb not to eat any ingredients that you can’t pronounce. Really, does tetrasodium pyrophosphate sound like something your body should know how to process? Simple and natural foods, like apples and pears, salad and cucumbers, are easily broken down in your body and the nutrients are available for your body to use. Meal planning is a habit that everyone needs in order to eat healthier! When you don’t have a plan, you’re more likely to grab something processed and easy to satisfy your hunger. Planning dinners for the whole week can save your sanity and save you money. It’s stressful to try to make a meal plan up on the fly compared to already knowing what you’re making. To me, figuring out what dinner will be that’s 90% of the battle! And, by having a list of what you need for the week’s dinners, you won’t overspend at the grocery store. Breakfasts and lunches can be planned the night before. If you plan to make an omelet or smoothie, it should take less than 10 minutes to make. If you don’t have that much time, try an overnight oatmeal recipe that’s mixed at night and ready to grab and go. Salads in a jar are super easy and leftovers are truly a lifesaver! 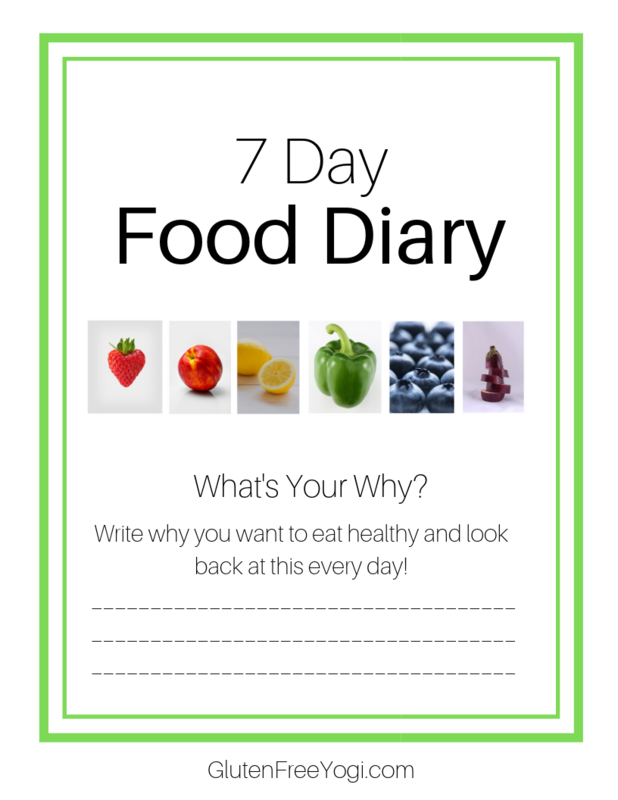 Get a FREE Printable Food Diary! Motivation to get healthier 1 day at a time! Simple steps for 7 days. Electronics (TV, iPhone, Computers, etc.) are such a distraction while eating. Turn them off and put your phone on silent. Make a commitment to yourself to pay attention to what your food looks like, smells like, and tastes like. Notice the texture and the temperature. Eat slowly and chew your food thoroughly. You’ll probably notice that you actually get full sooner if you are eating slower and paying more attention to the feedback that your stomach is giving you. Again, having awareness of the amount of food that you are eating is so important. As a general rule, your stomach is about the size of one fist. Yes, it stretches to accommodate more food, but most nutritionists say that you shouldn’t eat more than two fists worth of food at one time. I like that the government has now changed from the Food Pyramid to a picture of a divided plate, aka My Plate. My Plate shows that ½ of your plate should be filled with fruits and veggies. The other half is split between protein and grains. I think this is a much better representation of how a person should eat during the day – one meal at a time. When you’re thinking of portioning your food according to My Plate, think color! We’ve all heard “an apple a day keeps the doctor away”. But a little more accurate is that a rainbow of foods every day keeps the doctor away. Fruits and veggies each have different nutrients. Eating the same ones every day can still leave you deficient in a few necessary nutrients. When you keep that food diary offered in #3, you may notice that your meals are heavy in Omega-6 fatty acids and low in their balancing partner, Omega-3’s. We need those Omega-6 fatty acids for brain health. Vegetable oils are high in Omega-6 and are found in so many processed foods, like dressings, pizza, chips, and processed meats. The problem is that Omega-6 is actually the primary building block of pro-inflammatory hormones. Omega-3’s, found in fatty fish, are the building blocks of anti-inflammatory hormones. These are important to be aware of and to try to balance them. But wait…. It’s not just the Omega imbalance that’s a problem. If you add in a high quantity of white processed carbs, your body is producing extra insulin. Having high levels of Omega-6 and high levels of insulin creates an “explosion of inflammation”. Little things add up…. Those candies at the office, free samples at grocery stores, and lollipops from the bank are just extra calories, sugar, chemicals and food coloring that your body doesn’t need. They don’t satisfy hunger and just add up to more bad choices during the day. Eating a bowl of ice cream or chips isn’t a good idea right before bed. Closer to bedtime, your body is working hard to get you ready for sleep. Instead of trying to cut out your snack completely, maybe try to have your snack an hour earlier. These tips are actual ways that I used to become a healthier eater. I know they can help you too! Please comment below if you have any other great ideas that can help others!